Whichever activity you participate in, whether it be bird watching or enjoying nature, having a binocular is handy in many aspects. One, you’ll be able to look at anything, even if it’s far away, as if you were standing right in front of it. Second, in situations where you can’t be close like when you are birding, you can simply pull out your binoculars and watch without scaring the bird off. However, carrying around a binocular may be a difficult task and most likely bothersome due to the size of average binoculars. With the use of compact binoculars, you’ll be able to carry around one with you everywhere you go, so that you can have it ready when you need it. In this article we will go through the best compact binoculars so that you easily can find the right pair for you. We will go through lightweight binocular reviews in the end of the article, but first we will list the absolute best lightweight binoculars on the market right now. Let’s get right into it! Compact binoculars have a harder time containing features that bigger binoculars contain, but you should focus and lean towards the ones with better features, such as multi-coated optics, nitrogen-charged optics, and more. These features will make the difference between seeing your target with clarity and comfort and not being able to see the target clearly. When choosing your binoculars, make sure to have the features that you need in mind, so that you can choose the right binoculars with the features that you want, so that you won’t have to overpay for a pair that has features that you will never need or doesn’t have the features you want at all. If you don’t want your binoculars breaking down after the first trip, then focusing on the quality of the product is also something that you should look for. Alongside this, you should also look at how well the product performs under different weather conditions because even though your product may endure drops and scratches, if it can’t stand water or fog, then it is just as bad as any other product that may not have protective armoring. The armor should be made from rubber or a similar type of material, so that scratches won’t do much to it and drops won’t make a dent. If you get a product without rubber armoring, then scratches will go directly on the binoculars which may affect the pressure inside the optics, and drops will make dents which may affect focusing and disrupt your view. The price of the product will change your experience with your binoculars greatly, just like with any other product category. The more you spend, the better features and quality you will get, but this may not be the best scenario for you as you may be on a budget. However, we recommend that you set the maximum amount of budget that you can set aside for binoculars for your next trip, as the more you spend, the better experience you will have. 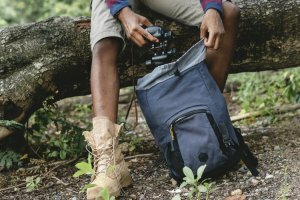 The products that we review will vary in terms of price, so make sure to know your budget and try to spend as much of it as you can on binoculars as it will make a big difference on your trip. Since you are looking for the best small binoculars, the size must be compact. Most compact binoculars will have the size of around 8×20-26, with the 8 standing for the magnification and the 20-26 standing for optic diameter, which is the average of compact binoculars in general. There are some binoculars with higher magnification and wider optic width size, but these aren’t recommended, as they feel bulkier and weigh a bit more as well. Higher magnification also requires a lot more stability as is a lot more sensitive which is why going for a lower magnification is a lot better for compact binoculars. For the best compact experience, stick with 8×20-26 size and you should have a great time with your small binoculars. Compared to the rest of the products, this one must be one of the best travel binoculars because of its size, weight, and quality. Nikon, known as one of most popular camera brands, used its technology that is used in cameras to capture high quality images to provide you with binoculars that will give you a clear view of whatever you are looking at. The ability to stay lightweight with the quality that this product can provide you with is astounding, which is why we are recommending this product to you as one of the best lightweight binoculars. The features that we love about this product has to be the compactness, as it blows the competitors out by a long shot. With the ability to fold into a tight structure when not in use and extend to fit the user when in use, this product is the most portable and compact in our opinion compared to other products. Also, the weight of this product is amazing. At only 0.61 pounds, or around 10-ounces, you can carry this product around in your pocket or bag without it being much weight at all, so that you can carry it around wherever you go. This product also contains basic features such as coated-optics and roof prisms, so that you can get a clear view of your target without anything stopping you from viewing what you want, clearly. As one of the more expensive products on this list, the quality meets the price. 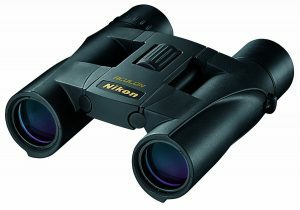 As with all other Nikon products, these binoculars are made to last quite a long time because of the protective armoring and the way the product is designed overall. If you feel and see the product in person, you will be able to see that the product is designed like a tank while staying lightweight, giving you more comfort, since you know that the binoculars won’t break easily even if you drop it frequently. If you can take good care of these binoculars, you’ll be able to use this product for a very long time. The price of this product isn’t the most affordable, but compared to other products in this price range, this product is the best bang for the buck. Save yourself the trouble and avoid the cheaper binoculars and go with one that is reasonably priced like this one, so that you won’t have to replace the cheap binoculars often. By investing into quality binoculars like the Nikon ACULON once, you’ll have a pair of binoculars that you’ll be able to use for a very long time without needing to replace it, saving you more money in the long run. If this product runs a bit past your budget, there are a few more products waiting below, so read on if you cannot afford this product. 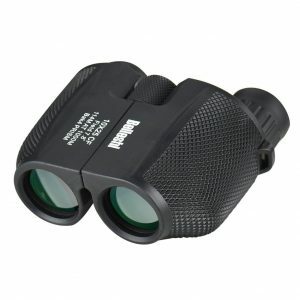 The size of this product is 8×25, which is perfect for those looking the best compact binoculars available. With this size, you’ll be able to carry around the product inside of your pocket without it looking out of place and you’ll also be able to fit it inside a purse or small backpacking bag without any issues or it taking too much space. Overall, this product is great if you are looking for a small product with plenty of features, good quality and is affordable. The most durable of all, the Bushnell is a compact binocular that can handle anything you throw at it, whether it be fog, water, or even hard drops. If you are one that isn’t too careful around tools and if you know that you will drop your binoculars a lot, then it is recommended that you go for a durable one such as the Bushnell Binocular compared to more fragile ones, as this will save you a lot more money and headaches. If you are this type of person, then we highly recommend that you get this product because cheaper ones will most likely break in one or two drops and to replace them two or three times can easily pay off the amount you will have to pay to get this product which will easily last through more than 20 drops. 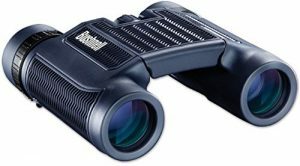 The Bushnell, other than being durable, comes with some features that make it a great, compact binocular to carry around. One of the features that we liked were the BaK-4 prisms and the optics. This is because, in locations where the lighting isn’t the best, it may be hard to see your target, but with the help of the prism and the multi-colored optics, you won’t have any problem seeing the bird or target you want to see. Another feature that we would like to mention is the waterproof design of the binoculars. As the binocular is nitrogen purged and O-ring sealed, water won’t be able to go inside of your binoculars and mess up the interior which will ruin your overall experience. As we explained before, the quality of this product is on the upper side due to the way the binocular was built. When something can last a longer period compared to other products while maintaining similar features, then it is considered a quality product and that is the case with the Bushnell binocular. Since it can withstand most drops and can even withstand fog and water, it can last a lot longer than other products. This will allow you to use this product a lot longer compared to other products. Alongside this, the Bushnell is also made from materials that will also last a long period of time, such as the focus knob and the coating. The price of this product isn’t as expensive as the product above, but around the average range in terms of price of compact binoculars. Although this product isn’t the best small binocular you can get, it is one of the most affordable and worth every single dollar you pay for it. Alongside the product being affordable, it also lasts a longer time due to its durability, which means that it will save you even more money. Aside from being durable, this product is also quite compact, which makes it great as a travel binocular. The size of this product is 8×25, which is the same as the Nikon ACULON. This size is great because it can fit inside of your pocket or side pockets inside of your backpack and it also won’t be a weight on your birding or touring trip. The magnification is not too weak or not too strong, which also makes it the perfect size for a compact binocular. 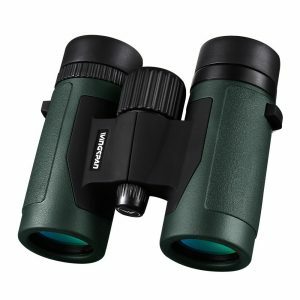 Overall, this product is great to have if you don’t want to spend too much, but still want to get a quality, compact binocular. If you are starting a hobby, such as hunting or birding, then the Beileshi Binoculars are the best pocket binoculars to start out with. This is because of the rock-bottom price tag, high magnification, durability, and compact size of the binoculars. If you are new, then it will be hard for you to handle a good pair of binoculars, especially if it is expensive, which is why we recommend this one as it is affordable, durable, and has the bells and whistles of binoculars in higher price ranges. Some features that this product has despite its low-price tag includes the BaK 4 prisms and coated lenses, waterproof and fog proof design, and the simple focus wheel. Same with the other products in the list, this product features the BaK 4 prisms and the multi-coated lenses which help use all the light in your surroundings to help you see the clearest image possible. The waterproof and fog proof design is like the one found in the Bushnell, although it isn’t as protective. Although it will survive drops into rivers, mud, and foggy mornings, it won’t be able to survive as many drops as the Bushnell as this product is a bit on the lower end. The one thing that we also love about this binocular is the focus wheel because of how easy it is to use. This is because this binocular’s focus wheel is so simple to use, that even a child will be able to use it. 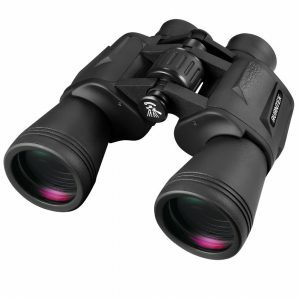 Like the Bushnell Binocular, this product has weatherproof features that make it last a longer period, thus, raising the quality value of this product. Although this product doesn’t have that much protection, it still has enough rubber armoring to protect itself from short drops and protect itself from dents. However, this product has an excellent rubber grip which will allow you to have the perfect grip on your binoculars, so that even if you happen to accidentally trip or lose your grip strength, you’ll be able to maintain your grip on your binoculars. The price of the Beileshi binoculars is the most affordable out of the products in this list which makes it perfect for those on a tight budget and those who just started a hobby that requires a binocular for the most enjoyment. As it is on the cheaper side when it comes to binoculars, you will be less pressured in keeping the binoculars safe, as replacing it won’t cost a lot, so that you can enjoy your hobby without worrying. The size of this binocular is a bit different from the two above, as the size is 10×25. This means that although the size of the optics is the same, the magnification is a bit higher with this product compared to other ones. There is a pro and con to this with the pro being that you can see things that are farther away, easier. However, the con is you will have to keep your hand a lot more stable while observing due to the higher sensitivity with higher magnification. Overall, this product is great because it is so affordable that you won’t have to worry about breaking it while experimenting with your new hobby while trying out features that are presented in higher end models on your Beileshi binoculars. 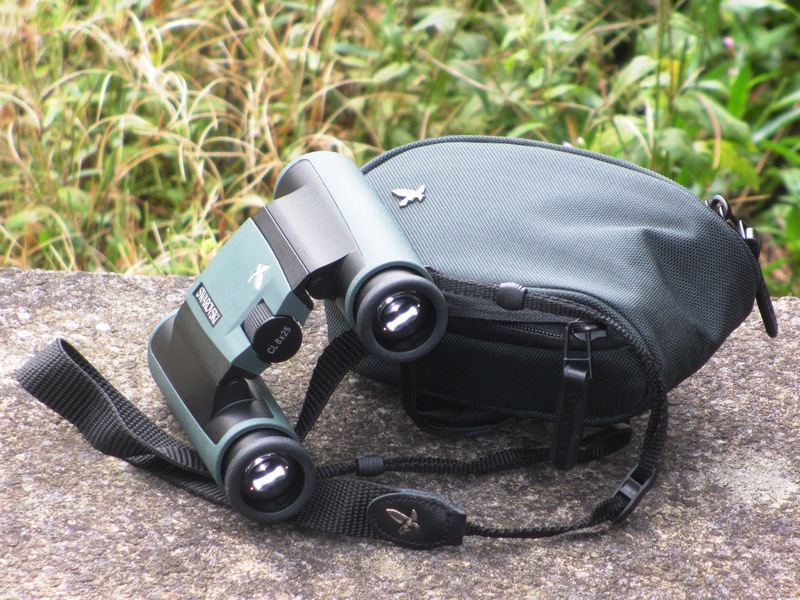 Although a bit on the expensive side in terms of lightweight binoculars, this binocular is a great one to get if you are looking for a durable and lightweight binocular for your activity. As it is made with a decent amount of quality and comes with a variety of features as well, we highly recommend that you look at this product if your budget permits. However, if you are on a budget, you should pass this one and look at the other ones, as they are of decent quality and come with high definition clarity as well. The features of this product include wide FOV, instant focusing, and clear view. The wide FOV is incredibly helpful, especially if you are bird watching because you will be able to track whatever you are watching or find whatever you want to find with ease due to the wider FOV. The instant focusing will also help in certain activities that involve movement, as you will have to spend less time focusing and spend more time on observing as if you were right in front of your target. Lastly, the clear view is obtained by allowing more light to enter your binoculars, making your vision a lot more higher definition. This will allow you to capture even the tiniest details so that your bird watching journal or your star gazing diary can be written out in detail. The quality of this binocular is exceptional, mostly due to the price of this product. As this binocular is the most expensive compared to the other products, the quality is a lot better. The weight of this binocular is also the most efficient compared to other products in the same price range, as the features and clarity of this binocular is a lot better than others. This binocular also comes with an ergo-nature grip that will allow you to have a strong grip on your binocular, so that you won’t drop it on accident and break it. Overall, the binoculars are built to last and will last you a long time. The price of this product is one of the weaker aspects about this product. However, we believe this price is worth paying, as what you get with this binocular is a lot better than paying a bit less and getting a binocular that is a lot lower in terms of quality and features. The lifetime value of this product is also one of the best, making it a good choice if you are one that likes to invest a bit more, in the beginning, to save more money over time. Overall, we love this product because it has decent features, is built to last, and is one of the lightest binoculars available for all your activities. If you are on a tight budget, then this binocular should be something that you should look out for. We consider this binocular to be the best budget lightweight binocular because although it is quite affordable, it comes with decent features, quality, and is very light as well. In addition, this binocular also carries quite a punch in magnification as well as having a wide FOV for all your viewing needs. One of the features that we liked about this product was the optics, as the clarity that you get with these binocular matches others that are a lot pricier than this product. 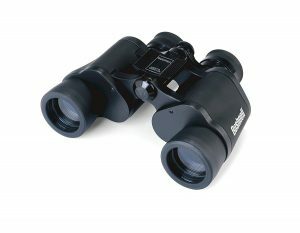 This is obtained by having quality optics that will let you see the tiny details on the bird or star you are observing. Also, the wide FOV is a feature that we love because if you have a tight FOV, you will barely be able to find anything due to how tight your view is. Lastly, the weight of this product is a feature that we know you will love as well. As this product has a small structure, the weight is light as well, making it a good product for both children and adults to use without feeling fatigue on the arms. The quality of this product can be seen both internally and externally. Internally, the optics are of high quality, giving you the clear and high-quality view that you will be able to obtain using these binoculars. Externally, you will be able to see the beautiful design that this product has as well as the way it is built to be durable and last a long time. If you want a binocular that you can drop a few times or scratch up without affecting your experience, then we recommend this product as this one can last through many drops and scratches. If you are looking for a budget binocular, this one should be one of the top on your shopping list because it is simply one of the best backpacking binoculars. With a price that is affordable and with features and quality that is seen in pricier products, you will have no problem using these binoculars with confidence. Even if this product won’t last as long as others, it will last long enough to be of value to anyone on a budget. Overall, we recommend this product if you are on a tight budget and you cannot afford any of the other binoculars as this product will give you similar features and quality of more expensive models with an affordable price tag. Perfect for those going on multiple trips or participating in multiple activities, you will be able to get an HD view while having a light binocular in your hand. As this product was built for those who are adventurous, it is built to be durable and contains features that are geared towards those who use the binoculars a lot more often. Some features that we loved about this binocular includes the wide FOV, the multi-coated optics, and the adjustment ring. The wide FOV will allow you to find the bird you lost while you were resting your eyes, find the ball in the baseball stadium after it has been hit, and even see the distance between you and your prey while hunting. This wide FOV will also give you a lot more freedom since you will feel a lot more restricted with a tight FOV. The multi-coated optics is useful if you want a clear view without any vision loss, as the coated optics will deliver crisp images for your viewing needs when you need it. The adjustment ring is also a feature that we looked closely at because if you have a bad adjustment ring, you will have a hard time finding the right focus to get a clear view. The quality of this product is one of the best out there as this product was meant for those that are extremely active with the binoculars. It is built like a tank, meaning that it will last through many drops and will last through most minor scratches as well. The rubber armoring on the binoculars will also help the binocular absorb the shock that would’ve been delivered to the binocular directly if it wasn’t for the rubber armoring being there to help protect the binoculars. The price of this product isn’t as expensive as the first product, but affordable. However, the true gem of this product is the value, as the value you get with this binocular cannot be beaten by some of the better binoculars out there. With an affordable price, quality features, and durable design, you will be able to use this product for a long time without having to worry about it breaking or dropping in quality. Overall, we highly recommend this product over the others if your budget permits and if you want to experience the quality and features that this product presents without breaking your bank. Whether you are starting a new hobby or whether you are looking for a new pair of binoculars because your old one wore out, a quality, compact pair of binoculars is a good choice. When you are picking your binoculars, remember to compare the price to the features and quality that you are receiving, so that you don’t overpay for your binoculars. Also, try to avoid going for cheaper binoculars as they tend to break a lot easier and you will have to replace them a lot faster than quality ones. We highly recommend that you invest in a quality one, like the three products we reviewed above, as they will last for years and you will spend less money replacing them while getting better features at the same time. Whichever one you choose, we hope that you enjoy your trip/hobby/concert with your new pair of compact binoculars as wherever you go, you’ll always be able to carry around your compact binoculars!